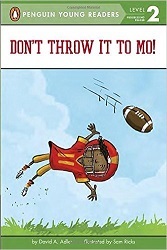 ﻿ Sonderbooks Book Review of Don't Throw It to Mo! Review posted September 5, 2016. Penguin Young Readers, 2015. 32 pages. The publisher labels this book “Level 2” for the “Progressing Reader.” It uses simple sentences and lots of pictures – but tells a story with a plot and a twist. After a few plays like this, the other team’s not worried about Mo – setting him up to catch a long pass and win the game. That summary, of course, doesn’t do the book justice. The author uses the simple sentences of an early reader as an asset, building the suspense and making the result believable. I told you what happened. Readers will see and understand what’s happening. And when they read the words themselves, they’ll get a big pay-off when Mo wins the game. Mo’s not the only winner from this book.